Cook konnyaku in wok as directed on package, adding vegetables to the boiling water for the last 3 min. ; drain. Return konnyaku mixture to wok. Konnyaku are thin translucent gelatinous noodles made from the starch of a yam-like tuber known as "devil's tongue." Shirataki, which means "white waterfall" alluding to the appearance of these noodles, is the term used for the shredded form of konnyaku. Since konnyaku has no flavour of its own, it absorbs the dominant flavours of the soup or dish to which it is added. Konnyaku can be found in both dry and soft forms in Asian markets and some supermarkets. 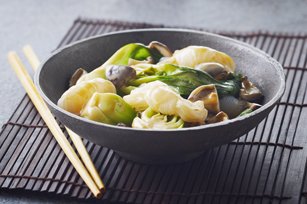 The konnyaku and mushrooms team up to provide a high source of fibre in this tasty recipe.